Vintage Christmas is the best Christmas ! The holiday selling season is coming to an end. As it does, it’s time to take a look at this Dude's holiday sales. For me, it’s always fun to look back and see what sold, and for how much? It helps me decide what to buy at future yard sales and stockpile for the next holiday season. Overall, I had a some pretty good sales. Check out a few examples of the holiday stuff I flipped this year. Although I’ve never bothered with them in the past, I am starting to realize you can make some decent money flipping vintage Christmas decorations. Lighted candles, tree toppers and alike from the 50’s, 60’s and 70’s, seem to get plenty of buying interest. I guess for many people, vintage decorations bring back childhood memories of Christmas. 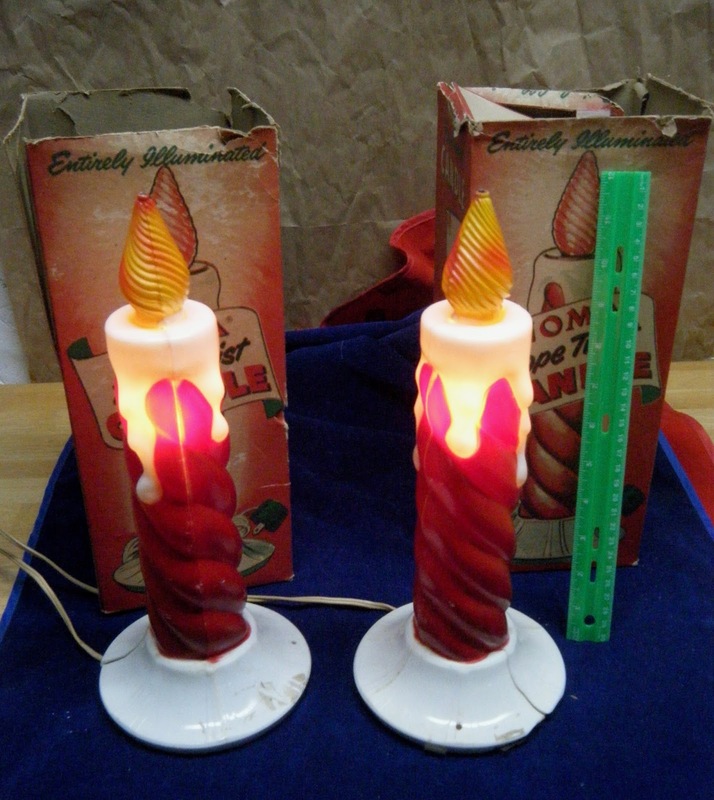 For example, check out this vintage set of plastic ”rope” candles. I bought this set at a yard sale for a dollar, then stored them away until the holidays. They came in their original boxes which always increases buyer interest. Although a neat little set, I decided that once you factor in shipping and fees, they were not worth the trouble to post as an eBay auction. Instead, I listed them on a local Facebook yard sale group for ten dollars. But minutes after posting them, I began to realize I may have under priced the candles. Almost immediately, potential buyers began stacking up in the posting’s comment section. The candles had attracted way more interest then I’d expected! The following day, a Facebook buyer picked up the candles up, slipping a ten dollar bill under my welcome mat. While I’ll take ten bucks any day, after seeing a dozen people line up for the candles, you can be sure I’ll double my asking price next time! Live and learn, right? Blow molds continue to be one of my favorite holiday items to sell. Over the yard sale season, I accumulated various blow molds and piled them up like cordwood in my garage attic. When it comes to yard sales, it seems like sellers price them very low. Maybe it’s because in spring and summer, holiday decorations are the last thing people want around their house, or they just need to get the big, bulky figures out of the garage? Whatever the reason, if the price is right on a holiday blow mold, I'll buy them. On occassion, I even luck into a blow mold at the Goodwill store. 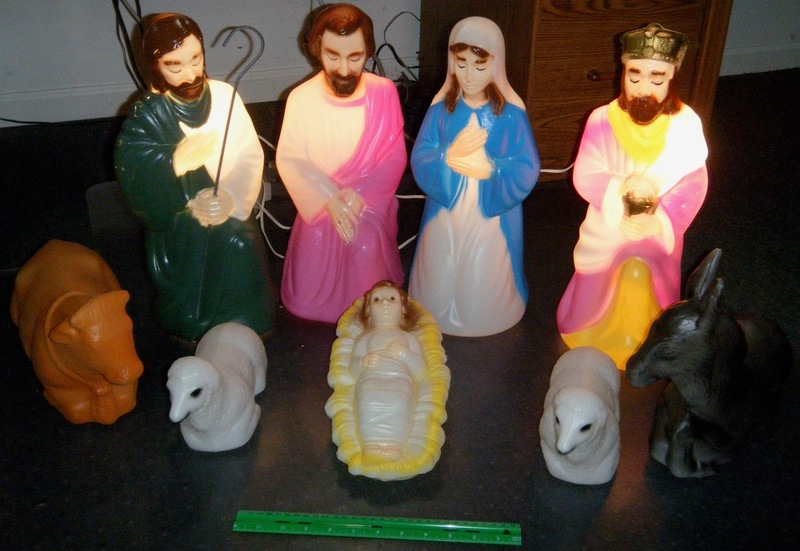 Just a few weeks ago, I bought this small, nine piece Nativity set for twenty dollars. Since it was December, the timing could not have been better. I immediately posted the set for sixty dollars on Craigslist. A day later, a buyer drove to MoneyintheGarage headquarters and handed me three crisp twenty dollars bills for the set. You have to love a quick flip like that!! Staring me in the face! branches that need to be removed from their paper sleeves and carefully inserted into tiny holes on the main trunk. Being a little lazy, I filled in as much as I needed for the photo, then began snapping away with my digital camera. After the photo session, the tree went up on eBay. I made it a ten day auction so that as many people as possible would have time to find the listing. I also timed the listing so it ended on Sunday evening, when most people are home and ready to bid! My combination of luck and prep work paid off. After ten days, the vintage tree sold for $285 dollars! The buyer, who lived on the West Coast, paid all shipping costs as well. 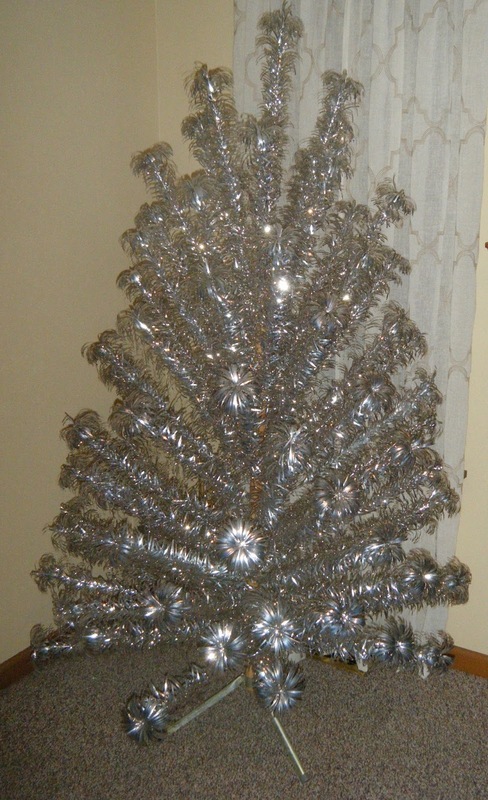 At nearly $300 bucks, it's easy to see why I consider vintage aluminum Christmas trees to be the Holy Grail of holiday finds! making some little kid happy somewhere. The vintage Christmas lights seen here date back to the 1960’s. I know because these were the lights my Dad put up on our house back when I was a kid. Back then, I couldn’t wait until the lights went up. I would bug and bug my Dad until he finally found the time to get outside and hang them on the house. As he did, I would generally make a nuisance of myself under the mistaken belief I was actually helping him. Once they were up, the bright, colorful lights looked awesome! For me, it was one of the most exciting days of the holiday season and meant Christmas was right around the corner. But even though they looked great on the house, once the energy crisis of the Seventies hit, those big, electricity gobbling lights went by the wayside. Like many other people in the neighborhood, the big bulb lights were tossed aside in favor of smaller, more energy efficient lights. My father boxed up the old lights up and slid them into the attic. Years later, I pulled the old Christmas lights out of my parent’s attic with the well-meaning intention of hanging them on my own house. That never happened, so this year I decided it was time to finally part with the old lights. After posting them on Facebook and receiving no interest, I turned to eBay, listing them for $25 dollars. That’s exactly what they sold for! Fortunately, the buyer was located only one state away, keeping postage costs down. After fees, I made about twenty bucks. Not a huge sale, but since I am trying to downsize, there’s now one less box in the attic. Hopefully, those lights will get hung up again just like the old days. Who knows, maybe there’s a little kid trying to help his father hang them on their house right now? I hope so anyway. That aluminum tree and my Dad’s vintage lights were a pretty nice way to end the holiday selling season. I hope you had some great sales this season too. More importantly, as we come to the end of another year, I want to wish you a Merry Christmas and a very Happy New Year! Thanks also for following my antics on MoneyintheGarage. Keep on flipping and let’s all hope for a safe and prosperous 2017! Holiday season steals and deals ! Happy Mid-November! Time to rake the leaves, watch football and oh yeah, start selling Christmas stuff on eBay and Craigslist! I’ve been delaying posting holiday items for weeks now, but it looks like I can’t put it off any longer. 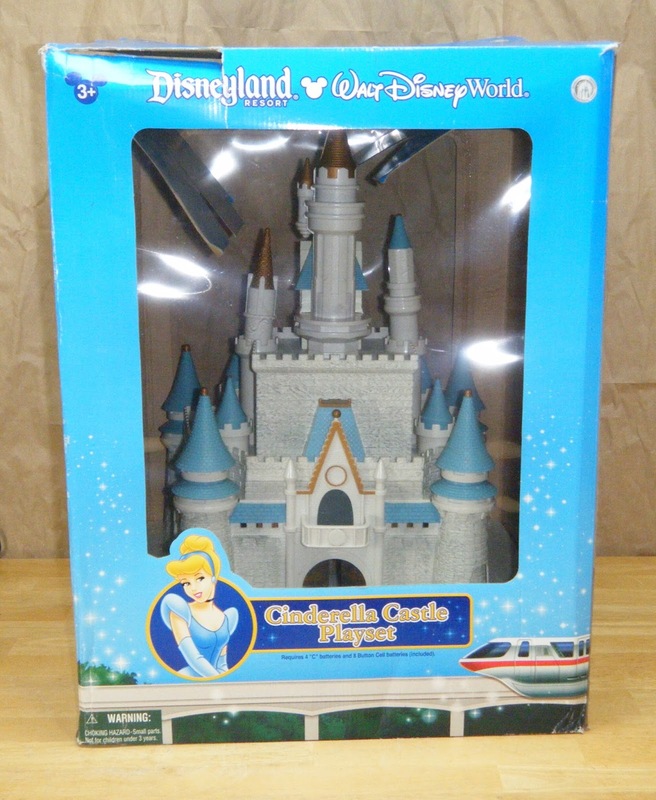 This past weekend, I noticed some early signs of holiday shopping after re-posting a Disney Castle on Craigslist. 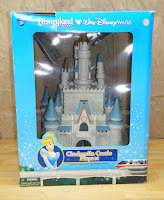 The castle is part of Disney’s Monorail “Park Exclusive” playset. I scored a great deal on it, scooping up the Castle, plus two additional playset pieces on a Facebook yard sale group for only twenty dollars. I quickly sold the other pieces on eBay, but surprisingly, the castle received zero interest. I then switched tactics, auctioning off only the castle figures. They sold for $24 dollars, leaving me with just the lonely castle and it’s box. I then assumed I’d make a quick and easy sale using Craigslist. Boy, was I wrong. Despite multiple postings on Craigslist, the Castle was ignored by buyers. That was until this past weekend, when I re-posted the castle again on CL and received multiple inquiries on it. A few days later, a buyer finally e-mailed me saying he wanted the castle for his Christmas train platform. I met him in the parking lot of a nearby golf range and he paid me ten dollars for the empty castle. Not a ton of money, but I was happy with the ten since I'd already made plenty of cash from the castle figures and the other park pieces. After the seller paid me, I couldn’t resist turning his ten dollar bill into a basket of golf balls and hitting some sweet drives! how often do you come across a Halloween themed piece? For me, I‘d say almost never. That was until I found this Department 56 "Mickey's Haunted Mansion" at Goodwill. I paid just $6 bucks for it and felt pretty lucky. Not only did I conveniently find it just weeks before Halloween, but it also came in it's original packaging. Truth be told, I am not a big fan of Department 56 pieces anymore. Most of them seem to bring ho-hum prices. I really hesitate to buy them, unless I am sure it will sell for big bucks. But that’s not the case with a Halloween/Disney themed piece. I posted my Mickey’s Haunted Mansion on an eBay auction and it sold for a sweet $86 dollars! I need to find a few more of these type of Department 56 pieces, and less of the Heritage, New England and other too many to list Village pieces! I vant to be on eBay! In addition to Mickey’s Haunted Mansion, I recently flipped this rare Telco “Motion-ettes” Dracula for very good money. Let me share a little advise on these animated rarities: if you come across a Telco Halloween animated figure you should leap at the chance to buy it! With the exception of the very common wicked witch figure, pretty much all other spooky Telco Motion-ettes characters sell for crazy money on eBay. Most stand two foot high and move back and forth when you plug them in. Back in early fall, I spotted this Dracula in his tell-tale orange box hiding in pile of yard sale junk. I made a beeline right to him and asked the seller how much? When she told me five dollars, I couldn’t get the money out of my pocket fast enough! ! Once I got Drac home, I dusted him off and made sure he worked correctly. I then posted him on Ebay where he sold for $90 dollars! At that price, even Buffy the Vampire Slayer would love this little guy. Let’s also not forget about the holiday that falls after Halloween and before Christmas...Thanksgiving! 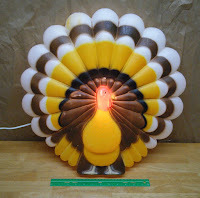 I will admit that when it comes to finding Thanksgiving themed items to sell on eBay, I haven’t had much luck. For me, I just don’t see much Turkey Day stuff at yard sales or thrift stores. 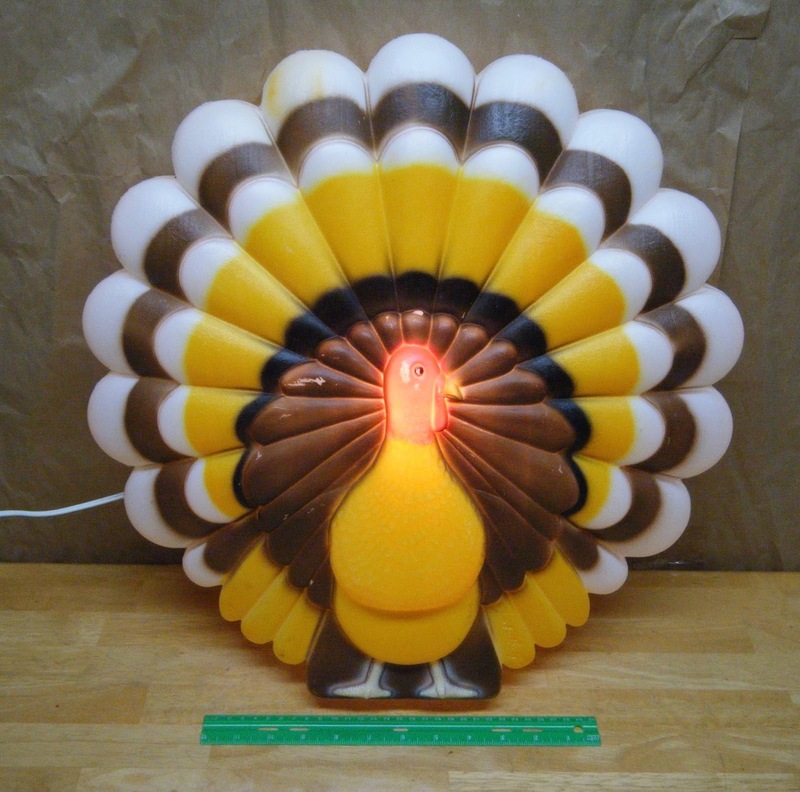 However, last winter I did find a Thanksgiving Turkey blow mold at the Goodwill Store. It set me back $8 dollars. At the time, Thanksgiving was nowhere in site on the calendar, so I held off selling my turkey until we got closer to the holiday. It was worth the wait. It turns out that these big plastic birds can go for a lot of money on eBay. Recently, one sold for over a hundred dollars. I was hoping to do as well, but my turkey had some paint loss on the plastic, making it a little less desirable. Not that I am complaining. My gobbler sold for $75 dollars. After shipping costs, I made a profit of about $50 dollars. Not bad for a piece of plastic! Harley-Davidson Motorcycle ...Buy it low and sell it high! The leaves are starting to turn and Saturday morning garage sales now require a jacket. As I've powered through the fall yard sale season, I’ve been finding some pretty sweet scores. But just as in past years, I still need to keep my nose to the grindstone and build up the eBay inventory so I have plenty to sell through the winter months. It doesn't help however, that there just doesn’t seem to be as many “Mega” yard sale Saturdays like in past years. I’ve complained about this phenomena in past posts, blaming it on the the advent of Facebook yard sale groups. Who needs the hassle of hosting a yard sale, when you can post your stuff on-line? But either way, here’s hoping a few more folks decide to clean house and have a yard sale before the season winds down in November. I’ll keep you posted, but in the mean time, check out my latest ruminations on buying and selling Harley-Davidson. When acquiring Harley-Davidson stuff, or anything else in this business, you just can’t beat it when you get the stuff for free! 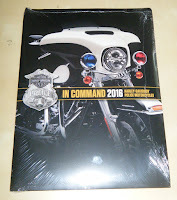 This Harley Davidson catalogue featuring special edition police motorcycles was handed out as a freebie at a local car/motorcycle show I attended. 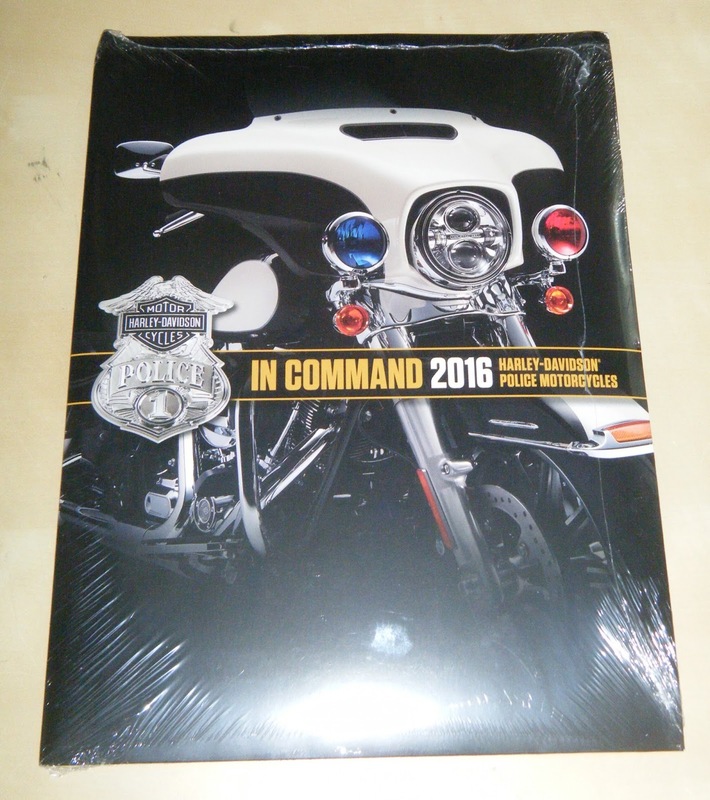 These specialty catalogues are generally distributed to police departments only and feature law enforcement equipped Harley Davidson bikes. Not wanting to look too greedy, I grabbed two from the dealership display, but in retrospect, I really wish I snagged a few more. I sold the catalogues on eBay for $15 each, earning me a total of $30. If I get to that car show next year, you can be sure I’ll stuff my bag with more of these freebie catalogues! Here’s a sharp looking men’s Harley shirt I found at the Goodwill store. Harley clothing is usually nice and heavy, the better for protecting and insulating the rider while on the bike. This shirt was no exception and had the feel of one of those heavy-duty LL Bean canvas shirts. The only difference was the Harley Davidson logo embroidered above the shirt pocket. I paid five dollars for the shirt and posted it on eBay. After a seven day auction, the shirt sold for a solid $41 bucks. While we’re on the subject of Harley shirts, let me point out that Harley-Davidson dealership T-shirts DO NOT typically sell for a big money. On any given trip to the thrift shop, it’s more likely you’ll find these ever present dealership T-shirts before you find a button down Harley shirt or jacket. Keep your money in your pocket when you come across these shirts and stay focused on button-down style shirts. Moving up the "sell high” scale, I recently flipped a women’s Harley biker jacket. The black leather jacket had all kinds of things going on, including; belt buckles, zippers and fringe. I found it on a Facebook yard sale group, paying forty dollars for it. That was a big investment for this thrifty dude, but one that I knew would pay off. It went right on eBay and after a seven day auction, sold for $85 dollars. Not bad, but the real "piece de resistance" in my buy low/sell high Harley flips had to be this awesome looking Harley Cafe Racer leather jacket. I scored this bad boy last year for $45 dollars at yard sale. 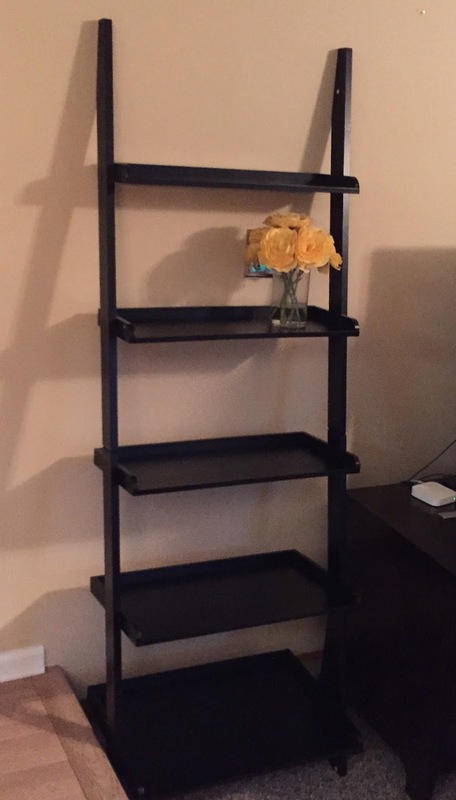 Originally, the seller wanted $60 bucks, but after some wheeling and dealing, he agreed to knock $15 dollars off the price. I really liked the cool look of this racing jacket and apparently so did many Harley riders. The bids for the jacket went over two bills and topped out at $220 dollars, proving once again that when it comes to Harley-Davidson gear, you really can buy low and sell high! How about you? What kind yard sale stuff have you found that guarantees a buy low /sell high price? Share your story in the comment section below. Two hot summer flips and one suspicious story. Even though we're still in the slow dog days of summer, I've been on a bit of a sales hot streak lately. You may have noticed my Twitter feed from last week when I posted a superb trash-to-cash find. Traveling down a quiet country road on the way to Goodwill, I spotted a disc golf target sitting out at the curb. If you're not familiar with them, disc golf is just like golf, only you use a Frisbee or "disc" instead of a golf ball. 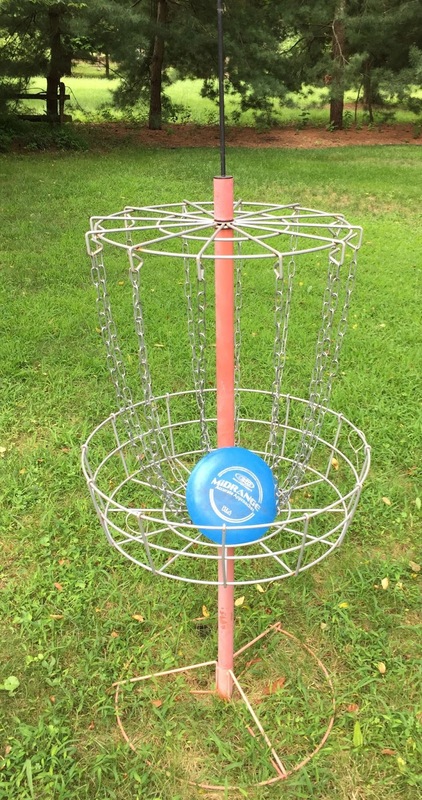 The metal stand is the "hole" you're aiming for with your disc. The game has become very popular with the Millennial and Gen X kids, with disc targets selling for as much as $200 dollars. Seeing some free dollars coming my way on this trashed disc target, I immediately turned the truck around and doubled back to investigate. A quick up and down confirmed it was in perfectly good shape, so I lugged it into the truck bed, strapped it down, then continued to Goodwill. As it turned out, the disc target was my only "find" that day. (Unless you count fresh flowers and veggies bought at a local farm stand.) For purposes of this blog, and also cause I like money, I wasted no time posting the disc target for sale on Craigslist. It was up for sale just hours after pulling it off the curb. Exactly one week later, a young Millennial backed his SUV into my driveway, handed me $80 bucks and pulled away with the disc golf target. That's what I call a "trash to cash" success story! 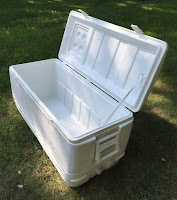 Another "dog days of summer" flip was this huge ice cooler I bought last month at a yard sale. Not that I am complaining, but I was more or less forced to pay the guy his asking price of twenty bucks for this thing. It's a rare occasion when your Dude hands over money without some attempt at negotiating. In the case of ice coolers, I am accustomed to paying five or ten dollars at the most. However, I noticed some troubling interaction between the husband and wife after hubby quoted me a price of twenty bucks on the cooler. At hearing the price, the wife gave hubby an angry stare and mumbled under her breath, "Only twenty dollars?" Having been on the receiving end of a few angry spousal stares myself, I decided to pass on any negotiations so as not to annoy the seller's wife further. I handed over twenty and lugged the bulky cooler back to my truck. Even at twenty, I knew I could easily make money on it. Big ice coolers are a must-have for any fisherman worth his salt. Fishermen pack them with bait, beer, food provisions and the day's catch. The local geography was in my favor too. With the Atlantic Ocean and tributaries close by, many locals own their own fishing boat and could use a good cooler. I put the big box on Craigslist anticipating a quick sale. A few days later, I sold it for seventy dollars! At that price, it was no wonder that women stared at her poor husband! Lastly, here's an "interesting" Craigslist transaction I recently made. 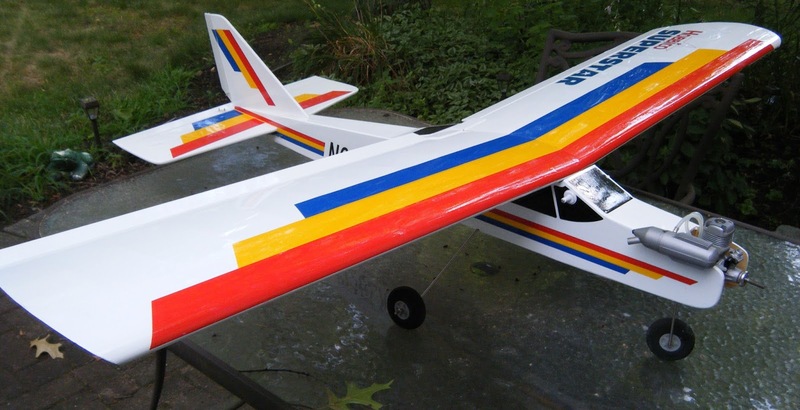 Check out this Hobbico radio controlled airplane I bought for a $20 dollar bill at a yard sale. This cool looking plane came in the original box with the radio controller, manual and some peripheral gear. The plane looked like it was barely used and was in near-perfect condition. After doing some research on the plane, I learned it was a basic Hobbico beginner's model that often retails for about $130 dollars. Since it was too big to ship, I skipped eBay and went with Craigslist, listing it for one hundred dollars. After seeing no interest whatsoever, I dropped the price each week, finally getting a bite at sixty dollars. The buyer agreed to meet me at Dunkin Donuts to purchase the plane. He brought along his wife and ten year old son. I was a little caught off guard by both sonny boy and his father. The kid was so excited to see the plane, he started grabbing at it before Dad even paid me! Having raised my own little Rugrats, I know how kids can easily break something in their excitement, so I moved the plane out of his reach before any damage was done. After saving the plane from the kid's attack, the drama wasn't quite over yet. Dad threw me one more curve ball. He claimed to have brought sixty dollars with him to buy the plane, but was forced to use ten of it to put gas in his car. He now had only fifty dollars to spend on the plane! This seemed a little suspicious, because as he was explaining this, his wife announced she was going into Dunkin Donuts to buy something to eat. (I could be wrong here, but Dunkin Donuts usually expects payment for food.) Adding to my suspicions was the fact that dad bragged about several radio controlled airplanes he already owned. This was obviously not his first rodeo when it came to buying expensive model planes. Either way, I was pretty sure he was scamming me, but it was getting late and I wasn't about to haul the plane back home. I told the cash-challenged Dad not to worry about it, I'd take fifty. With that, he handed over what apparently was all the money he had left in the world. But no biggie, even with the dad's bait and switch, I still made thirty dollars on the deal. The sad passing of boxing legend Muhammad Ali has been all over the news. 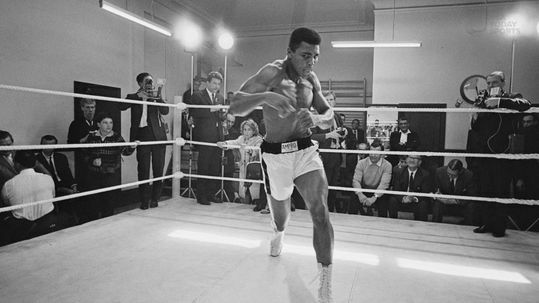 There's no doubt that Ali was the most famous and most recognizable professional athlete in history. On his passing, I thought this would be an appropriate time to share one of my little yard sale flips, that yes, actually had a direct connection to "The Greatest." 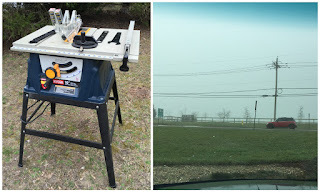 About two years ago, I was doing my usual Saturday morning picking, this time at a community yard sale held in the parking lot of a real estate office. Meandering around, I stopped at a table and spotted a piece of paper for sale with an autograph on it. The small, aged paper was protected under a clear plastic sheet, the type you might snap into a three ring binder. The seller was asking twenty dollars for it. Looking closely at the signature, my jaw dropped in amazement...it read "Muhammad Ali". "The Greatest" found at a yard sale. If anyone was watching me at the time, I am sure they would have observed a very confused looking dude. Could the autograph of the greatest heavyweight champion and most famous athlete in the world be for sale at a yard sale? Clutching the plastic sheet in my hand, I stared at the autograph wondering if it was legit or not? This once-in-a-lifetime find had me excited, but I needed more information before pulling the trigger. I asked the sellers what the story was on the signature? The sellers, a couple in their 70's, explained they once lived down the street from Muhammed Ali in the town of Cherry Hill, New Jersey. They went on to tell me they met the Heavyweight Champ at a neighborhood cocktail party. Describing Ali as a gentleman and very accommodating, they said the Champ gladly signed autographs for many of the neighbors on the street. Like everyone else at the party, the couple asked Ali for an autograph and he obliged them, signing the piece of scrap paper I was now holding in my hand. Listening to the couple's story, it all seemed to ring true to me. I knew for a fact that Ali actually did live in Cherry Hill back in the Seventies. Also, the autographed piece of paper had some age to it and looked like it could easily date back to the 1970's. Processing all this information, it didn't take long to make my decision. However, just to reduce my exposure in case the autograph was a fake, I offered the couple $15 bucks which they accepted. As an added bonus, there also happened to be a separate autographed postcard of another boxer under the plastic sheet. This made my $15 dollar purchase a very nice two-for-one deal! Before getting to the main event, let me share how the postcard worked out. Researching the vintage postcard, I discovered it was signed on the reverse side by a boxing legend from an earlier time; the great Jack Dempsey. Dempsey, who was the heavyweight champ back in the 1940s, retired from the ring and opened a popular New York City restaurant, appropriately named, "Dempsey's". In fact, fans of the first Godfather movie will recall the scene where young Michael Corleone was picked up by the "bad" cop right in front of Dempsey's restaurant. Unfortunately, I also learned that Dempsey gave out these autographed postcards to dining patrons like some establishments hand out after dinner mints and toothpicks. In other words, Dempsey's autographed postcards are quite common and not worth a whole lot. However, it was worth just enough to cover my initial investment. The autographed Dempsey postcard sold for $15 bucks on eBay. This sale brought me back to even on my initial investment with Ali's autograph still to sell. The undercard sale of my Dempsey postcard now completed, I moved on to the main event. When posting Ali's autograph on eBay, I carefully laid out all the details the sellers shared with me regarding how they obtained it. To reinforce and back up their story, I also cited that fact that Muhammad Ali resided in the same town as the couple did during the early Seventies. And while not claiming to be a hand writing expert, I also pointed out my yard sale autograph looked "spot-on" to any of Ali's known signatures found on the internet. This elaborate description discussing it's provenance seemed to assure bidders. My Muhammad Ali autograph sold for $160 dollars! That's what I call a yard sale knockout! his passing. Obviously my find would have sold for even more money today, but no worries. The Champ did me a solid a few years back with an unbelievable yard sale find that turned a $15 investment into $160 dollars. So here's to "The Greatest." There will never be another one like him. Great bargains for under a dollar! 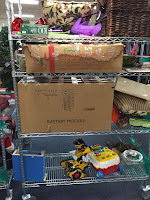 A few blogs ago, I spotlighted some one dollar yard sale finds I flipped for pretty good money. Dollar bargains are nothing to sneeze at, but you know what's better? How about stuff that only cost a quarter or two? That's why I always keep some loose change jingling in my pocket when heading out to the yard sales. You never know when you're going to snag a deal with just a coin or two. Here's a few examples of my quarter and fifty cents finds. Enjoy! Are you a fan of old time country western music? You may remember that way before there ever was a Florida Georgia Line or a Luke Bryan, there was Patsy Cline, Johnny Cash and Hank Williams. Check out this vintage deck of playing cards featuring all those great country western singers from back in the day. I paid twenty five cents for this deck at a church yard sale. Although I had no idea what they might be worth, how can you go wrong for a quarter? I am glad I did. They sold on eBay for $18 dollars. A pretty good return on a something that set me back two dimes and one nickel! When it comes to dolls, I am not what you would call an "expert". With the exception of American Girl or vintage Barbie dolls, I'll freely admit I am in the dark on collectible dolls. But if the price is right, I'll always take chance. Fortunately for me, the price was right on this commemorative edition Bell Telephone doll. This gal is suppose to depict a telephone operator from the good old days. She was in the original box, and for only twenty five cents, I just couldn't say no. Prior to posting her on eBay, I did a little research on the doll and found out Bell Telephone produced several different versions of her. Each depicted a Bell Telephone employee from different eras. Called "Telephone Pioneers of America", they also made several others dolls including a modern day telephone repairman. Following my research, I posted my old time operator on eBay. She "connected" me with a caller who paid twenty dollars for her! Moving to more modern times, how about some nice rock band posters from waaaay back in the Nineties? Here's one of two REM posters I came across at a yard sale last year. The seller was a thirty-ish dude, who told me he hung these posters in his college dorm room over 15 years ago. Now married with a baby on the way, he decided it was time to part with his old college dorm room posters. At only a quarter a piece, I was a buyer. Even though REM broke up over ten years ago, they remain hugely popular and their music is still heard on the radio today. Preparing them for an eBay auction, I decided to sell both posters in a single auction. Why deal with two separate auctions, two shipping tubes and all the extra time and trouble? It worked out great. My quarter posters sold to a buyer in Germany for twenty five bucks. Lastly, check out this funky transistor radio from the 1980's. I am a sucker for all types of old-school radios. From citizen band (CB) to police scanners to little transistor radios, if the price is right, I am buying. It's not just me who's into this dorky hobby either. There's plenty of electronic geeks out there willing to pay up for cool radios to add to their collection. In fact, I could do a whole separate blog when it comes to my radio flips. But since that would get kind of boring, we'll just stick with this one. Suffice it to say, radios can always make you some decent money. If you come across a name-brand transistor radio at a good price, it's probably worth buying. Generally speaking, the ones that fetch the biggest money on eBay were made prior to the 1970s by companies such as Panasonic, Zenith and Sony. The little Panasonic seen here cost me a quarter. I sold it on eBay for $19 dollars. See what I mean? Two dimes and a nickel put me just shy of a twenty dollar bill. Not bad. So those are a few sweet examples of some quarter flips. How about you? Got a few examples of your own? Give us a run down in the comment section below. Thanks for stopping by and good luck out at the sales! It seems safe to say that Winter is finally behind us now. The yard sales are definitely picking up and I've already made some early scores. Mrs. Dude and I also took the opportunity to host our own garage sale. It's been about two years since our last one, so we were overdue. Nothing feels better then clearing out the MoneyintheGarage inventory shelves. I'd say we unloaded about half of what we put out in the driveway, making $85 dollars in total. The remaining leftovers are now in the back of my truck. As I did following previous yard sales, I am trying to sell the leftovers in one big lot for $30 bucks. I am hoping a flea market seller will come along and pay up. Either way, one things for sure-the stuff is not going back inside the house! If it doesn't sell, the whole load is going down to Goodwill. It's the circle of life, only in junk. 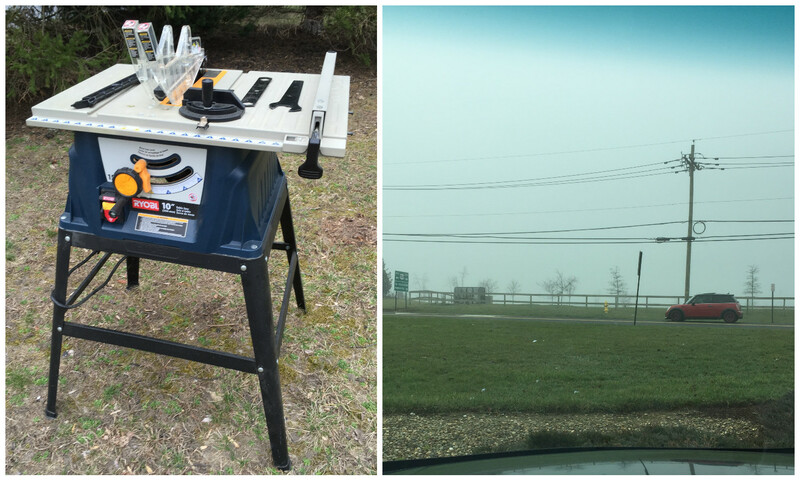 A Mini Cooper is great for transporting Ryobi table saws! Getting back to my regular sales, I did have some pretty sweet flips during the last few months. First up is this Ryobi table saw scored off my local Facebook yard sale group. It cost me...now get this...five dollars! Can you believe that? A Ryobi table saw retails for $130 or more at Home Depot or Lowes! Mrs. Dude spotted it and we claimed the saw within minutes of it's posting. Once we put dibs on it, I drove right over to the seller's house before he came to his senses. When I arrived, the guy told me he was cleaning out his garage and just wanted the nearly-new saw gone! I threw it in the truck, drove home, took some photos and posted it on Craigslist. Two days later, I'd sold the table for $75 dollars. That's a funny story too. The guy who bought it from me drove over an hour to pick up the saw. We met at a local convenience store and the buyer pulled up in a what has to be one of the smallest cars on the road; a Mini-Cooper! I started to chuckle to myself, wondering if the guy could fit a Ryobi table saw in the back of a little Mini Cooper. I'll give him credit though, he made it fit! I just had to take a photo as he pulled it away. Believe it or not, there's a large table saw in the back of that little thing! So not only did I make a quick $70 bucks, I got a good laugh too! furniture, I have learned just enough to get by. Namely that his modern (for it's time) designed wood furniture can sell for big bucks to the right buyer. I procrastinated several months before finally posting it as a "local pick up" sale on eBay. Local pick up only formats almost never work out for me. Without fail, some distant buyer doesn't pay attention to the shipping details and bids anyway. That's what happened with my table. 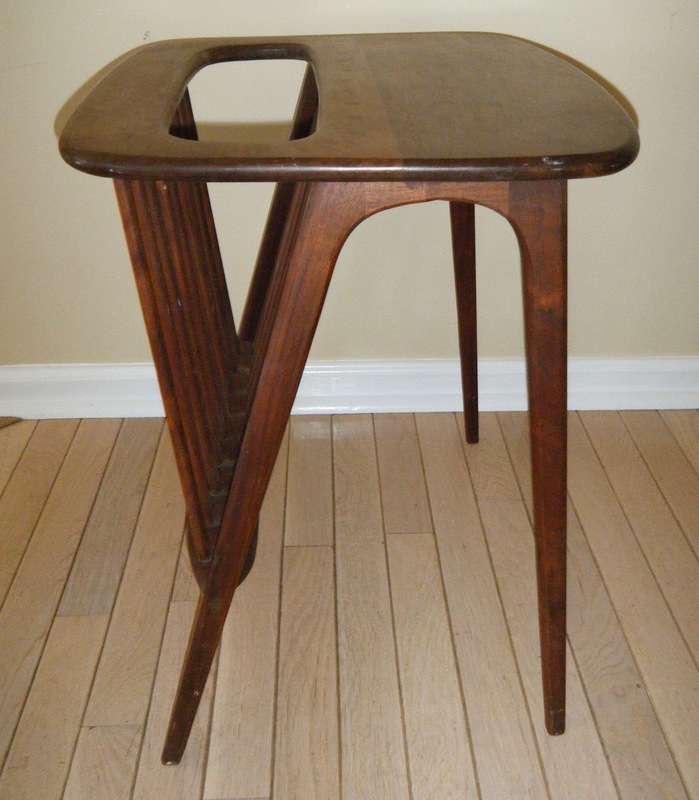 A Chicago architect was the winning bidder, paying $225 big ones for the table. He later e-mailed me and apologized after realizing the auction was suppose to be the pick-up only. But the story has a happy ending. The buyer had no problem covering the nearly $100 cost of packing and shipping the table to his Chicago office. Not only that, he paid me $40 extra for my troubles, making it a $265 sale! The table arrived safely in Chi-Town and the buyer left me glowing positive feedback! Sometimes things just work out! sidelines. The big guy always wore this style sweater and it became an iconic image. (Sort of like Dallas Cowboys' head coach Tom Landry and his top hat.) 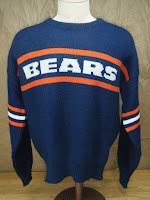 I've come across a few of these "old school" sweaters in the past and always buy them. I paid four dollars for this one at Goodwill. I sold it last month for $25. Not a bad little flip. (Had I sold it during the football season, I probably would have made an additional ten dollars or more.) 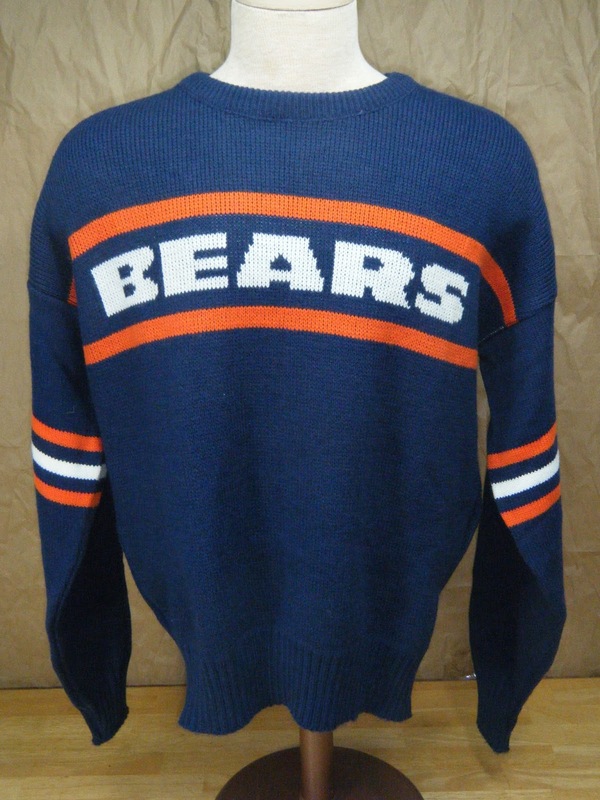 If you ever find this Chicago Bears style sweater, don't hesitate to buy it. The sweater vest version is also a big seller. Either style will make you money. 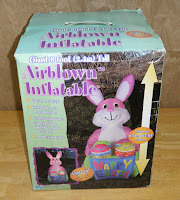 Wrapping up my winter flips, take a look at this Easter bunny inflatable I found at Goodwill. I had to grit my teeth and buckle down on this purchase, paying $30 dollars for the eight foot tall bunny. That price tag was waaaaay more then I normally spend on an inflatable. But this Easter Bunny was brand new in the box. Also, the timing could not have been better. I found him about six weeks prior to Easter and wasn't about to look a gift horse in the mouth. I posted the big Easter bunny for a BIN price of $135 bucks plus shipping. It sold within a few days, once again proving you can't lose flipping holiday inflatables! That's it for now. Hows the sales going for you? Got any Spring flips you want to brag about? Share your stories in the comment section below. 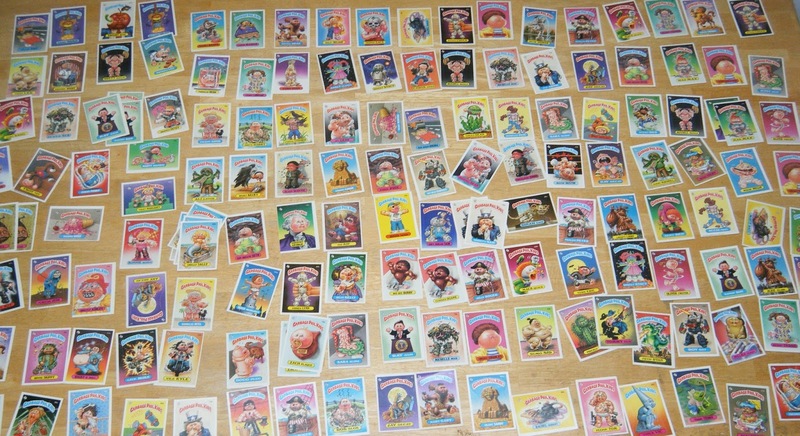 McDonald's collectibles you sell...and a few you keep. I don't care who you are, once in a while you gotta treat yourself to a Big Mac or Quarter Pounder! Sure, you can't go crazy on them, but everyone deserves some occasional decadence. If you grew up in the Seventies or Eighties, you probably remember how the Big Mac or Quarter Pounder was served. Not in wax paper, but in a very environmentally unfriendly, Styrofoam "clam shell." They were like a little Styrofoam house for your burger! When you think back, it was a incredibly wasteful. Especially if you were just taking your Big Mac from the counter over to the Formica tables to sit down and eat. Once you sat down at the table, you popped open the box, ate your burger, then tossed the Styrofoam container in the trash can. Who needs a little Styrofoam box for that? After pressure from environmentalists, McDonald's finally figured it out, going "Green" in the late Eighties. Gone were the little Styrofoam boxes and in came thin cardboard boxes. Still kind of wasteful, but at least the cardboard breaks down in the landfill after a few years as opposed to 100 years! These days, even the cardboard box is gone. Now when you order a Quarter Pounder, it's back to being wrapped in paper just like they did prior to the clam shell. So, of course, now that the clam shell is long gone people want to collect them! Check out the above photo. A recent eBay check turned up this ten piece lot of vintage McDonald's clam shells. It sold for one hundred dollars! That works out to ten bucks for each clam shell...wow! It hurts when I think back and calculate how many of these clam shells I threw away. Each time I did, I was literally throwing a ten dollar bill in the trash can...Ugh! Pssst, not just for coffee! That's not the only money I was throwing away at McDonald's. Remember the original McDonald's coffee stirrer? It had a tiny little spoon on one end with the Golden Arches at the other end. Back in the Seventies, it was the perfect tool for stirring coffee, and oh yeah, measuring cocaine! You read right. The "McSpoon" as it came to be called, was popular with drug dealers and users. In fact, the tiny spoon was perfect for measuring one hundred milligrams of cocaine. But in 1979, after learning their innocuous little coffee stirrer had become a big thing with drug dealers, McDonald's did away with them. Instead, they came up with a simple flat stirrer. No more measuring cocaine with a McSpoon! 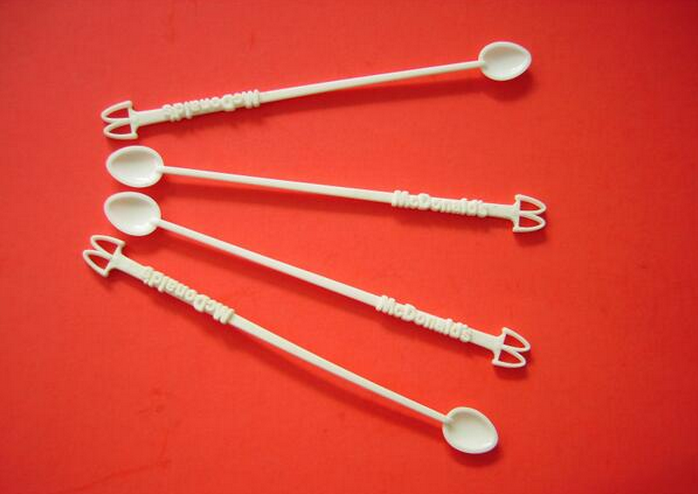 Today, McDonald's collectors (and maybe drug dealers) pay decent money for the discontinued spoons. A check of recent eBay sales show an average price ranging from five to seven dollars for each little hunk of plastic! Crazy, but true. If you're willing to take a peek inside the dumpster in back of your local McDonald's, you may come up with some other pretty nice scores. Promotional pieces that sit on the counter or floor can bring in some nice money. In one eBay auction, I found this counter display piece promoting Nintendo Mario Brothers 3. 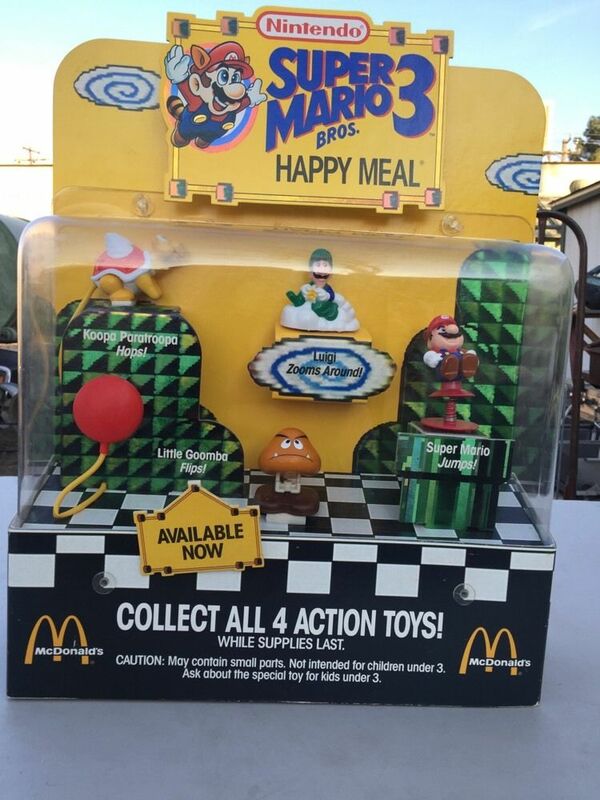 When it comes to collecting, combining Super Mario with McDonald's can be a home run. Whoever salvaged this piece must have known that. The rescued piece sold for $200 bucks on eBay! I also found an eBay auction listing a small counter display for Happy Meal Matchbox cars. That piece sold for $140 dollars at auction. Like the Nintendo piece and so many others, imagine how many displays were just tossed in the dumpster once the promotion was over! Makes me want to take a lookey-loo in the Golden Arches dumpster every once in a while. Another possibility is call the local Mickey-D's manager and just flat out ask for the display when the promotion ends. While some smart employees may have first dibs on them, it's worth a shot. But some McDonald's collectibles you just can't put a price tag on. 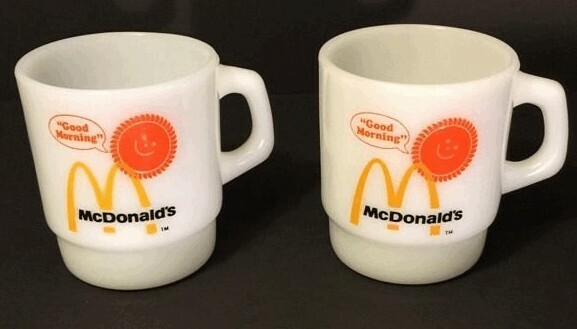 Take for example, these vintage McDonald's coffee mugs. These guys currently sell for as much as $15 dollars a piece on eBay. I actually remember when these mugs first came out. They were free when you bought the McDonald's Egg McMuffin breakfast. Back then, McDonald's had just started to serve breakfast. It was a pretty big deal, since prior to that, their menu was basically limited to burgers, shakes and fries and that was only after 11:00 AM! But around 1977, Mickey Ds started a breakfast menu featuring the "new" Egg McMuffin. My Dad was all over that! Thereafter, every Sunday morning after church, Mom and Dad would drive to McDonald's and order an Egg McMuffin sandwich and coffee with the free McDonald's cup. My old man thought those mugs were the greatest thing since the invention of color television! They were solidly made by Anchor Hocking/Fire King, the perfect size and best of all....free! Over many Sunday morning visits to McDonald's, my Dad developed an impressive collection of those sturdy little mugs. The old man held onto those coffee mugs long after the McDonald's promotion was over. He put them to good use too. He always had some major project to complete around the house...painting, construction, major car repairs. You name it. Every weekend it was something different. But no matter what the project was, my Dad always, always had one of those freebie McDonald's coffee mugs in his hand. (With the ever present steam lofting from the hot coffee.) He loved those damn things! As the years moved on though, my Dad passed away and his favorite coffee mugs slowly made their way to the back of the kitchen cabinet, then eventually disappeared. Some eighteen years later, after my Mom had passed, my siblings and I cleaned out the family house. To my happy surprise, I found my Dad's McDonald's coffee mugs. It was kind of like seeing an old friend! Stacked neatly, but dusty and dirty, they were buried deep underneath the kitchen sink cabinet. (The cabinets my Dad had built years before.) I took the mugs home and have them to this day. Some still even have paint on them from a few of my Dad's many painting projects. But after all those weekend projects and trips through my Mom's Kenmore dishwasher, the mug's are not exactly in high value condition anymore. They've faded and are a little worse for wear. But it doesn't matter. They're not for sale anyway. Instead, every once in a while, I break one out and enjoy a nice cup of coffee and think about my old man. Like all those tough old coots from the Greatest Generation, I think about how my Dad went to church, loved his family, always worked hard and ate Sunday breakfast at McDonald's. All the while, perfectly happy and content with the simple things in life, like enjoying a cup of Joe in a free McDonald's coffee mug. We can learn a lot from that generation. Anyway, what started out as a discussion on McDonald's collectibles, got a little sentimental. But hey, when it comes to your parents, what can you say, right? I'd keep writing, but apparently I got something in my eye, so that's all for now. So how about you? Any good McDonald's or fast food collectibles in your recent flips? How about stuff you won't get rid of due to sentimental value? Share your story in the comment section below. Great deals for only a dollar! Who doesn't like the Beatles, right? Finding a vintage Fab Four collectible at a yard sale is like hitting the lottery. Most vintage Beatles collectibles are worth serious bucks. For example, check out a typical eBay selling price for an original Beatles lunch box...WOW! 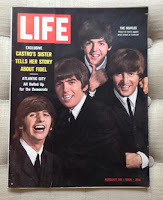 Although I haven't been lucky enough to find a lunchbox, I did came across a 1964 Life magazine with the Beatles on the cover. I found the copy buried in a stack of dusty old Life magazines at a yard sale. The seller was asking a dollar per magazine. Generally speaking, old Life magazines are not very valuable. Despite the fact the magazine went out of business years ago, old copies can still be found everywhere. It seems like everyone and their mothers held onto them! But some copies do have value. For example, issues that feature very famous celebrities on the cover like Marilyn Monroe or Ernest Hemingway are worth some major dough. In my case, I fingered through the dusty old stack, but could only come up with the 64 Beatles cover. But this wasn't just any Beatles cover issue. Nope, this happened to be the very first time the Beatles appeared on the cover of Life magazine! That's pretty big stuff, so I had no problem paying a dollar for this particular issue. I posted the copy on eBay and a week later it sold for $27 dollars. As John Lennon once sang, "Now gimme money...that's what I want!" Here's another very cool dollar flip also dating back to 1964. Check out this original 1964 Philadelphia Phillies yearbook. What's the big deal about an old baseball yearbook? For Philadephia Phillies fans, 1964 was a tragic, infamous year in Phillies baseball history. In the late summer of 1964, the Phillies were in first place with a six and a half game lead and just twelve games to go in the season. Leading all season, they were expected to easily clinch the National League Pennant. Instead, they choked big time and went on to lose ten straight games in a row, allowing the St Louis Cardinals to overtake them and claim the Pennant. It's considered one of the greatest collapses in baseball history and one that Phillies fans still mourn to this very day! Of course, all of this was flashing back in my mind as I thumbed through the yard sale copy I'd found. I couldn't believe I was actually holding an original yearbook from that tragic season! Maybe the seller was still grieving the loss too, because he only charged me a dollar bill for the yearbook. But because of this tragic collapse, there's actually no better Phillies yearbook to collect. Even yearbooks from the Phillies 1980 and 2008 World Series Championship seasons are not worth as much as the 64 "choke" season! This was born out when I posted the yearbook on eBay. My one dollar 1964 copy sold for $35 dollars! So while 1964 season was a rotten year for the Phillies, it was at least a good year for their yearbook! Here's a weird one. I've sold a lot of phones over my flipping career and made some good money doing it. In most cases, I've done very well with desktop phones in very specific colors like black or red. (Don't bother with beige or white.) A few years ago, I picked up this vintage desktop phone at Goodwill for a dollar bill. In my humble opinion, it's powder blue color is one of the ugliest I've come across. But at only a buck, I decided I'd take a chance on it. After cleaning it up with a little Windex, I posted it on eBay. To my surprise, this ugly blue phone sold for forty dollars! That's the amazing thing about selling on Ebay, you just never know what's going to bring in the big money. Even an ugly old phone can make you some serious bucks! Finally, I have to mention a sweet find I blogged about a few years back. This one is definitely worth repeating! I came across this vintage mechanical Momma "Spanking Bear" in it's original box at a local garage sale. When you turn it on, Momma bear spanks a fussy baby bear positioned on her lap. Pretty funny action, and probably something that wouldn't get manufactured today due to political correctness. But if you're lucky enough to come across a vintage mechanical toy like this, you can begin counting your profits immediately. These old toys sell for plenty of dough on eBay. I paid one dollar for Spanking Bear. I posted the toy on eBay, and after a seven day auction, that dollar bill turned into $90 dollars. Probably one of my best dollars flips ever! You gotta love dollar finds, right? How about you? Give up your best dollar flips in the comment section below. In January things are kind of slow at MoneyintheGarage. I am not exactly setting the world on fire with eBay sales, but that's deliberate on my part. With only thrift store and Facebook finds to bolster my inventory, I dial back the volume of listings. Why be in a big hurry to burn through what's left of my stockpile? Instead, I take my sweet old time. Hey, it's nice to kick back this time of year anyway. It won't be long until spring is here and I am back out plodding through yard sale after yard sale. So until then, it's a good time to relax and take a leisurely look back at some more of my end-of-year sales. 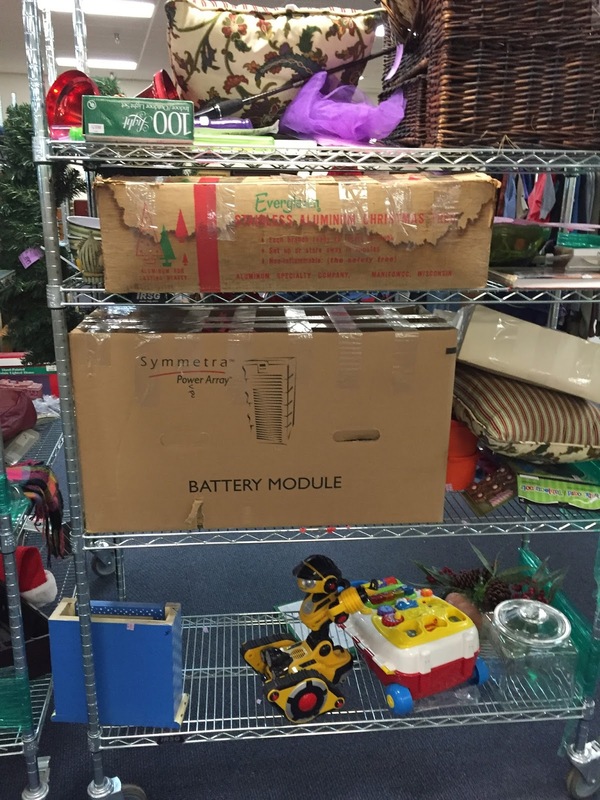 In early December, I headed to one of the very last yard sales of the season. When I pulled up to the seller's house, I realized I'd actually been there before. The sellers had hosted a previous sale back in the summer. The scenario was one I've come across countless times. The older couple downsizing and moving south to retire. This is always an ideal scenario to score some awesome yard sale deals. Retirees are super motivated to sell their things cheap. After all, who wants to load all that junk on a moving truck? That was the case with these folks. For example, they sold me a beautiful Les Paul electric guitar for a five dollar bill! But before anyone gets too excited, let me point out this was not a priceless Les Paul guitar from the 1950's. I am not that lucky! This was actually a modern day Les Paul guitar produced in China. While still very nice, these mass produced Les Paul guitars usually sell for a couple hundred bucks in most music stores. But either way, it was still a pretty nice find. I am guessing it was put out at the yard sale as a late morning afterthought. Otherwise, it would have been snapped up earlier before I ever showed up. Knowing I lucked out, I quickly handed over an Abe Lincoln to the retirees and swung the guitar on my back like some Bruce Springsteen Wannabee. Everyone loves Thomas the Tank Engine! Walking around further, I then spotted a big box of Thomas the Tank Engine track. The big box contained 16 smaller boxes of track in their original boxes. In fact, this find was "Deja Vu" for me! I had bought an identical lot from the couple in my previous visit months before! The sellers were definitely consistent in their pricing. Both times they charged me only five bucks for the entire box of Thomas track! I handed over another five dollar bill, knowing I could easily sell the track on eBay to holidays buyers. With two good scores in my pocket and stuff marked down to fire sale prices, I tried and tried to find a few more deals. But alas, after two garage sales their stuff had been pretty much picked over. After about ten more minutes of fruitless searching, I finally gave up. I wished them luck with the move and left with what turned out to be some pretty decent year-end scores. With the holidays fast approaching, I wasted no time posting the Thomas the Tank Engine tracks on eBay. To make it easier to ship, I listed the track in lots of four boxes each. Once a lot sold, I immediately reposted a new lot to sell. With so much track to sell, I was able to list four separate lots at $40 a piece and one remaining odd lot for $30 dollars. If you're keeping score, that's a total of $190 dollars in sales. Not bad for a ten dollar investment! The Les Paul guitar was almost as good. I listed it on Craigslist for $125 dollars. After a few weeks passed with no serious offers, I lowered it to an Even-Steven one hundred dollars. Not long after, I was meeting a millennial age kid in the parking lot of a local convenience store to sell him the guitar. The kid was taking no chances, actually bringing an amplifier with him to test out the Les Paul guitar. After a few loud strums on the strings, the future Elvis slapped a hundred dollars in my hand. Having originally shelled out only five bucks, that was a pretty nice profit! Continuing our overall tally, I invested a total of $15 dollars at the retirees' yard sale which netted me $290 dollars in sales. Well worth the visits I made to their yard sales before they headed south! Coke: Once again...the REAL thing! If you're a member of a local Facebook yard sale group, you know how exciting it is to be the first to lay claim to a great find. It's one of the reasons I am seriously addicted to my FB yard sale group! This vintage brass Coca-Cola "button" is an example. Most Coca-Cola buttons are the traditional white lettering with red background. While these traditional buttons sell well, the all brass buttons are much harder to find and as a result, sell for way more. Amazingly, the seller listed this vintage piece on Facebook for only $30 dollars. In a classic example of being in the right place at the right time, I happened to be looking at Facebook the moment it popped up. I immediately snagged it. I've seen enough episodes of American Pickers to know vintage Coca-Cola advertising pieces are highly valued by collectors. Worried that the seller might come to their senses and back out of the deal, I immediately drove to their house to pick up the Coke button. I was eager to see what this rare brass Coke button would bring, so I immediately posted it using a seven day auction on eBay. Turns out, Coke truly is the "real thing". The button sold on eBay for an impressive two hundred dollars. With great flips like that, it's no wonder I am always obsessively checking Facebook! How'd your year-end sales go? Any good Facebook or garage sale finds you want to brag about? Let us know in the comment section below.